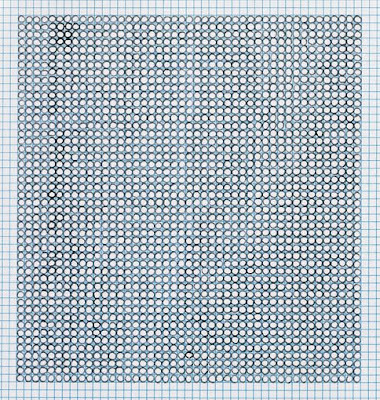 A detail from Eva Hesse's 'Untitled' drawing (1967), more or less A4 in size. It beautifully encapsulates something of the loosely grouped 'Process Art' of the late-60s and early-70s. Robert Morris contemporaneously "posited the notion of 'anti-form' as a basis for making art works in terms of process and time rather than as static and enduring icons". At a future-of-graphic-design-type-discussion at the RCA last year it was interesting to hear Rick Poynor question the lack of pursuit of 'form' in prevailing recent work. "In the days of form, people were interested in the Statue of Liberty- now sculptors aren't interested in Eiffel's structure anymore" Carl Andre Artforum June 1970. To which could be added- "and now their interest has shifted to Ellis island"
Frédéric-Auguste Bartholdi must be spinning. "To the sculptor form is everything and is nothing. It is nothing without the spirit - with the idea it is everything."